In a fast changing connected world, healthcare as we know it is changing fast. Our everyday life styles and health habits are changing also thanks to the new possibilities offered by technological advances in Big Data and Cloud Computing. Together with Tech leaders, influential Founders, CTOs, CIOs of the world’s most innovative companies, disruptive start ups, top talents, and over 400 investors and 300 accredited media we will discuss these Future trends in healthcare at the blue track of the Global Webit Congress. In a widely connected Internet of Things (IoT) world, that is becoming predominantly mobile, the current trend is to collect and store information in the Cloud. Cloud Computing allows fast access to the stored data in real time from anywhere. Businesses are increasingly moving toward cloud software services that cost less and are easier to manage. In Healthcare, digital records are stored and managed in the cloud. Healthcare indicators like heart rate, blood pressure, glucose levels are collected and sent to the cloud via wearable devices. Physicians are uploading information about their patients and sharing it with their colleagues. The critical information uploaded in the cloud is analyzed for better outcomes and access of the data. Companies like Salesforce, SAP SE, IBM and Oracle Corp among others, are investing in software and solutions targeted at specific sectors such as healthcare to boost growth. All this Big Data accumulated in the cloud can improve patient outcomes. Using new technologies Big Data is processed and analyzed to identify new trends and solutions that would otherwise be invisible or hard to track. Hospitals can now identify in real time the occurrence of patients with a highly contagious illness. Physicians can examine the information gathered from a patient and identify trends in treatment using data from a pool of other patients stored in the cloud again in real time. Using a desktop PC or an iPad, Android or Windows mobile device they can get to and manage this data from anywhere. Previously undiscovered negative drug interactions could be identified almost immediately using big data. The future possibilities of analyzing and making useful Big Data in healthcare are promising. Combining Cloud Computing and Big Data will lead to fantastic increases in efficiency and improved patient outcomes. 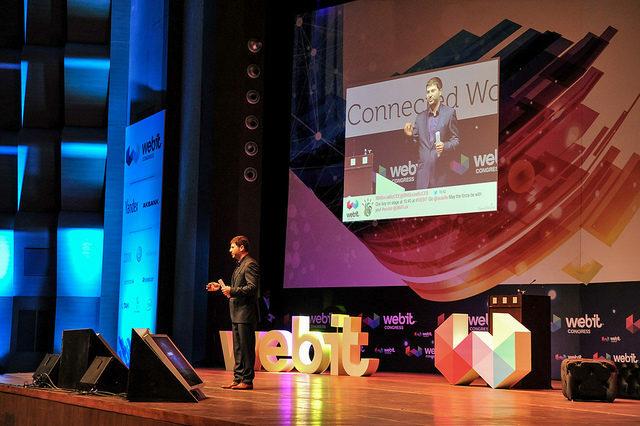 At the blue track of the Global Webit Congress, we will be discussing the interconnection of Big Data, Cloud Computing and Health Care.